So, you’ve dug up a bottle. It is dirt-encrusted and you dust and wash it to get a better look. Maybe it says “E. C. Lane” or “Little Falls Bottling Works.” You’re curious. You want to know more about this mysterious Lane guy, or the bottling works. Perhaps you think the bottle is rare and valuable. What is it worth, anyway? While staff at the Morrison County Historical Society (MCHS) can’t appraise your bottle to determine its monetary value (it’s not legal for us to do so), we can suggest that you do a little online research to see what such a bottle is going for on the free market. We’re even more useful at helping you uncover the history of your bottle. Let’s start with this Lane fellow. Edward C. Lane moved to Little Falls, Minnesota, around 1891. He was originally from Goodhue County and came to this city about a year after marrying Odila Burkard. According to Lane’s obituary, when he got to Little Falls, “he bought a bottling works.” (LFDT, November 4, 1912) The operative word here is “bought.” That suggests that a bottling works was already in existence when Lane arrived. The 1890s saw the height of a boom era in Little Falls after construction of the third dam and the subsequent influx of several large industries. 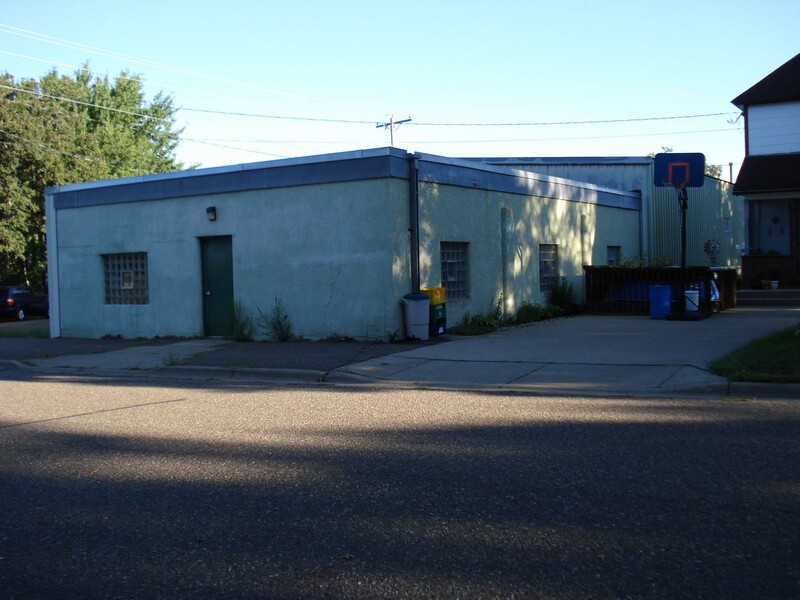 One of these industries very well could have been a bottling works, or possibly a glass-blowing factory, but a search of archival resources at MCHS turned up no evidence of a pre-existing facility. This leaves an historical loose end. While some of the bottles from Lane’s factory are labeled “E. C. Lane,” by 1907 he was using the name Little Falls Bottling Works for his business. (1907/08 LF City Directory) The collections of MCHS contain several E. C. Lane bottles. A note concerning one of them suggests that the bottles were hand-blown, which is very likely from the appearance of the bottles. They have bulbous mouths and bubbly glass, and the bottles are not absolutely uniform in size. There is the puzzle of seams along the sides and how Lane could have imprinted his name in the glass, but this was accomplished by blowing the glass inside a mold. Before the first patent for an automated glass blowing machine was issued in 1899, the blowing was done with human breath. Edward Lane died suddenly of a ruptured appendix on November 3, 1912. His wife, Odila, continued operating the bottling works. One of her employees was Clarence Sprandel, who, along with his brother Charles W. Sprandel, purchased the pop factory in 1914, officially taking possession of it on April 1 that year. (LFDT, April 3, 1914) According to the 1916/17 Little Falls directory, the factory operated under the names Little Falls Pop Factory and Little Falls Bottling Works. A couple of years later, potential competition for the Little Falls Bottling Works appeared on the scene in the form of Elias F. Brown and partners, one of whom was Frank Kiewel. Brown & Co. intended to build a new soft drink factory at 409 Third Street Northeast, which would open on January 1, 1917. Their plans changed by November 1916, when they purchased the Little Falls Bottling Works from the Sprandel brothers. There is a hint of the daily operations of the soft drink factory from an accident report filed with John Vertin for insurance purposes. (Document on file at MCHS) Two employees, Elias’s nephew, Ethan Brown, Jr., age 19, and Harry Smetzer, age 21, were both cut by glass in July 1922. They worked six days per week and were paid fifteen dollars per week. Brown & Co. sold the bottling works to Henry J. Minar and L. E. Hart in 1929. Minar was from Browerville and moved to Little Falls “to have charge of the business.” Hart, who had a business in Long Prairie, stayed in Long Prairie. (LFDT, March 4, 1929) Upon their takeover, they remodeled the factory. Along with the constant upgrades to the physical plant (at some point that brick building became stucco), Minar’s factory underwent several name changes. Minar and Hart officially called the business the Little Falls Bottling Company, although it was still informally called the Little Falls Bottling Works. When the Coca Cola franchise was purchased, the name changed to the Coca Cola Bottling Works. In the 1937 Little Falls Telephone Directory, the name was back to Little Falls Bottling Works, which indicates that the company was no longer a Coca Cola franchise. In 1938, the Little Falls Bottling Company name returned and the ad in the phone book shows that Seven Up could be had, along with other drinks. “YOU LIKE 7 UP . . . AND IT LIKES YOU!” It was a sign of things to come. Minar purchased a Seven-Up franchise sometime between 1938 and 1943 because by the time the 1943 telephone directory was released, the company was called the Little Falls 7-Up Bottling Company. By 1945, Little Falls was dropped from the name and the factory became Seven-Up Bottling Company. Henry Minar died in 1952, but the business kept going when his son Jim bought it. Jim had been working in the factory since 1936, starting as a bottle washer and case packer while in high school. Jim continued his father’s legacy of upgrading equipment and was still operating the Seven-Up Bottling Company in 1978. (LFDT, Oct. 21, 1978) A note in the files of MCHS says that he sold the business to Robert Gans of St. Cloud in November 1979, but no source has been found to confirm this. The Seven-Up Bottling Company remained in operation until 1991-92, after which its listing disappeared from the local phone book. And now you know more about that crusty old bottle of yours than you probably wanted to know. Little Falls Bottling Works, 609 Fourth Avenue Northeast, Little Falls, MN. Photo by Mary Warner, August 29, 2007. 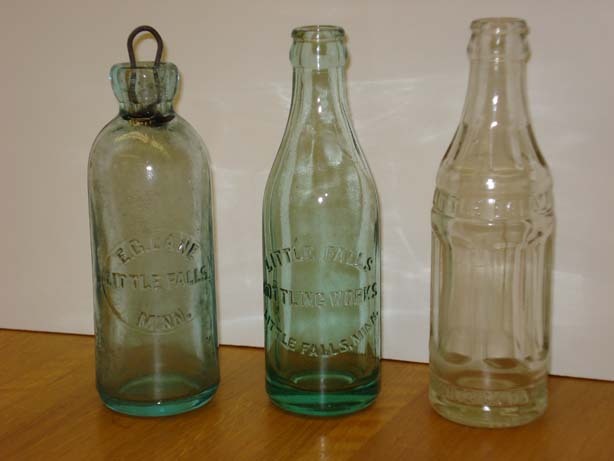 Bottles from the Little Falls Bottling Works in the collections of MCHS. The left one is an E. C. Lane bottle with a metal and rubber cork. It appears to be hand-blown. The others are later models. Photo by Mary Warner, August 29, 2007. What a strange coincidence; my stumbling upon this site by accident.I hail from Little Falls, New York and we have here bottles of the same type of manufacture excepting that our samples are from area makers. It was my intentinn to seriousely look into the idea of forming a Little falls Bottling Works here as we have over two million gallons of pure,tested water dumping into our Mohawk River. The supply comes from a four inch diameter pipe that taps into the side of a hill where it is believed a glacial lake is the source of the water.According to geologists, there once was a Sea at LittleFalls created during the so-called Ice Age. The waters eventually abated off the face of the earth and this hill may have trapped much of it in some way. The pouring from the pipe has never ceased evenduring the hottest of summer days. It is a constant flow and is extremely cold.No one can ever recall when the volume of water issuing from that pipe had slowed down or had lost its force of power. Again, an intersting observation in that two cities of the same name have a kind of similar connection. Family lore suggests a Mr. Grest was a partner or employee of the Brown or Minar group. Any record of that? Hi, Mark – I checked our Grest Family File to try to find an answer to your question. Unfortunately, nothing in the file mentions a Grest in relation to the Little Falls Bottling Works. I’m afraid that’s one of those questions that would take considerable work to tease out. We gutted our guest cabin on Ponto lake, MN. While digging out the crawl space, we have excavated several old bottles. One is the (middle 1 in your pic) with a cork. As I washed off the dirt on the outside of the bottle, foamy bubbles were coming out of the cork. I put it outside to avoid whatever was happening??? Hi, Pat – Not sure what is causing the foamy bubbles from the cork. It’s hard to know what people may have used old bottles for once the pop was gone. It was a wise move to put the bottle outside to let the bubbles off-gas somewhere safe. Is the cork inside the bottle? If so, perhaps there is a way to safely get it out and discard it so you can keep the bottle. We found a bottle near Browerville Minnesota. Labeled Browerville Bottling Works . Was there a plant in Browerville Minnesota.? Hi, Duane – I’m not familiar with whether there was a bottling works in Browerville. While the town is very close to Morrison County, it is in Todd County. I wonder if the folks at the Todd County Historical Society could help you with your question. Here’s a link to their website: http://www.toddcountymuseum.com/. Thanks for your question. I was reading the blog on Morrison county history and I came upon your question “Was there a Browerville Bottling Works?” Yes there was. My grandfather owned it and all I have is a picture of the building with a delivery truck in front of it. I don’t know too much about the plant, but I know there was one. Thanks so much for letting us know, Shelia. It’s great to have someone related to a past business jump in and expand our knowledge of history. Have you considered showing your photo to the Todd County Historical Society or maybe providing them with a copy? That will help to expand their knowledge base.